In 1990s California, Mia is the daughter of first generation Chinese immigrants. Though her parents were professionals in China, jobs are harder to come by in the U.S., and the family finds itself managing a hotel whose cruel owner treats Mia's parents very poorly, often failing to keep his word and exploiting their desperation for work for his own gain. Because her parents don't make much money, Mia doesn't have many of the luxuries enjoyed by her classmates, which can be painful at times, but she makes the most of her situation, often manning the front desk at the hotel and becoming friends with the "weeklies" who live there all the time and with the various Chinese immigrants her parents secretly allow to stay there without paying. At school, she also makes friends with Lupe, a fellow immigrant and tries to steer clear of the hotel owner's son, Jason. 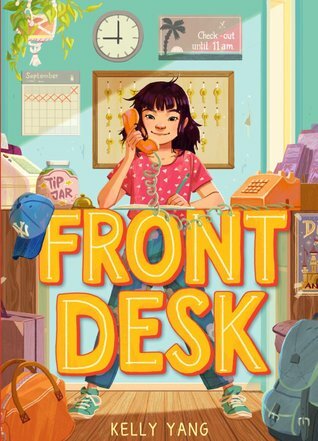 Front Desk has all the qualities of an excellent middle grade novel: a strong plot grounded in the author's real-life experiences, a believable protagonist who infuses the story with hope, despite the many hardships she must endure, a mostly black-and-white sense of right and wrong and a great setting with lots of lively supporting characters. I sat down to read just one chapter of the ARC (from Edelweiss) before bed one night, figuring I'd read the book over a period of several days. Two hours later, it was 2 in the morning and I'd read the entire book. It is absolutely engaging from start to finish, and absolutely worthy of the praise it has been receiving from reviewers. In recent years, I have been fairly disgusted with the way ALA has politicized its awards, but while I have mostly lost faith in that organization, I do think this book is as worthy of recognition as many of my favorite Newbery-winning titles from decades past. Kelly Yang is an excellent writer, and she manages to make a grim set of circumstances fun and entertaining to read about in a way that still feels respectful of the seriousness of the situation. She also keeps everything age-appropriate and mostly avoids preaching at the reader. It's definitely in the top 5 books I've read so far this year, and I will cross my fingers that it receives some formal recognition. Sounds interesting. And I hear you on the ALA--and I'm a librarian!